This is my favourite of all the Indian accompaniments. If your mouth is ablaze with a spicy curry or kebab, then this is the perfect way to keep the fire buring. It’s an intensly fresh flavour which packs a little punch itself. There’s nothing tricky about it and it does add that level of authenticity to your dishes that will amaze your guests. If you want to spice it up a bit, then leave the chilli seeds in. That should do the trick. with a hand blender or in a food processor, blend all the ingredients into a smooth paste. Adjust the seasonings to your taste. That’s it! 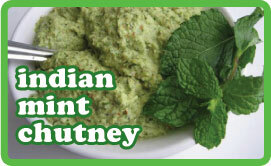 As an accompaniment to a kebab or dryish curry. Be sure to have a raita to hand too.